The UM FLAT or University of Montana Forum for Living with Appropriate Technology was founded 10 years ago by Derek Kanwischer, an Environmental Studies graduate student, as his thesis project. He convinced the university to provide one of the university owned properties on Fifth Street to be a living and learning student house focused on urban sustainability demonstration. Since then, each year six students live on the property and work to advance the FLAT’s mission of building community and advancing everyday sustainability. 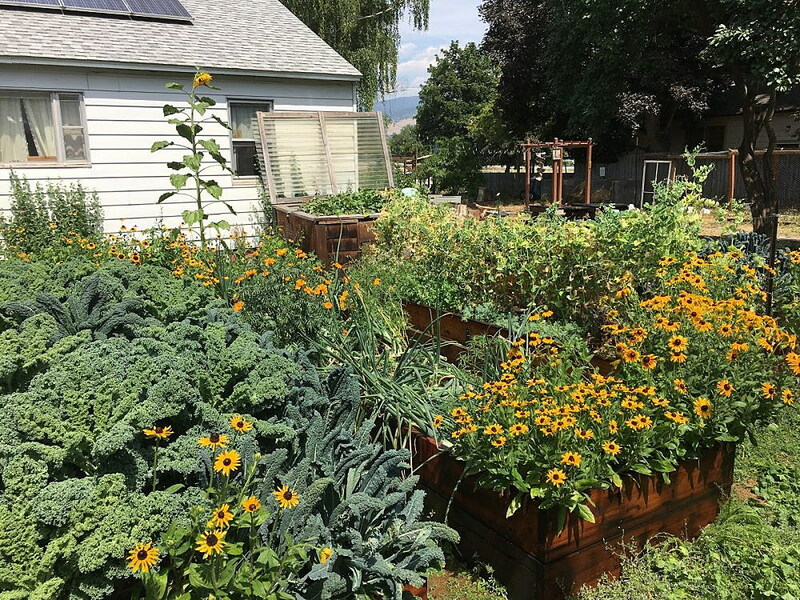 The house now has solar panels, a large vegetable garden, chickens, compost, and a sustainably remodeled garage turned community gathering space. Like many Missoula area households this fall, we at the FLAT have been raking leaves, planting garlic, removing dead tomato plants, and doing general tidying up of our yard and garden. We also finally took charge of our neglected compost bins that sit on the southwestern edge of our yard. A little less than a month ago the cinderblock three-bin system was a classic example of an unmaintained compost pile. An unmaintained compost pile isn’t a compost pile at all. Without proper monitoring and care, it’s just a pile of food scraps, dead leaves, straw, organic matter, and dirt. Compost piles need to be turned and watered regularly. If the pile is too cold or too hot, its composition may need to be tweaked. There could be a surplus or deficit of nitrogen. We, along with a few student volunteers from the university, spent a few hours on the project. We emptied the bins, mixed their contents with our dead tomato plants and other yard scraps, and then shoveled the whole pile back into the cinderblock bins all while adding water. After a week the piles got up to about 140 degrees. After two weeks, we turned the piles again and discovered a bunch of ashy looking bacteria. These actinobacteria signify that the pile is running out of oxygen and that it is time to turn. It’s incredible how much change happened inside the piles in just two weeks. The mixture lost a lot of volume and the particles became much more broken down. 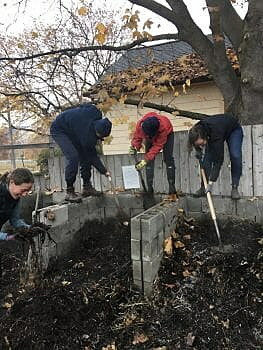 Our resident compost expert, Dara, says that if a pile goes above 160 degrees, the bacteria doing the good work of breaking down the organic matter will run out of oxygen and die. They will choke on their own success. While shoveling, we realized that a compost pile is a good metaphor for human civilization and climate change. Like the bacteria we are developing at a rate not supported by our environment. We’re choking on our petroleum use and causing climate change. We are on track to overheat. Unlike the bacteria, we humans are aware that we are overheating. We can make changes. Here at the FLAT, we think a good place to start making changes is in our everyday lives. Composting, like many everyday sustainable habits, takes effort. The amount of effort is minimal, but unlike the alternative, it’s not zero. With our current understanding of our ecological crisis we, unlike the ignorant bacteria, have a responsibility to change our behavior. Wendell Elliott, Hanna Deacon, and Mary Ellis are current residents of the UM FLAT. November 14. UM Recycling Committee meets to tour UM Recycling facilities & discuss challenges. All welcome. Meet on Nov 14 at 2 pm in the lobby of UM Facilities Services. For more info, email the ASUM Sustainability coordinator. November 15. Missoula Community Needs Assessment meeting. Open to all. Missoula Public Library Large Meeting room. 4 – 5:30 p.m.
November 19. Radical Realism for Climate Change. Four impressive panelists discuss local food security, direct action, sustainable energy policy, and coal industry rhetoric. Sponsored by Missoula Rises. Missoula Public Library. 6:30 – 8:30 p.m.